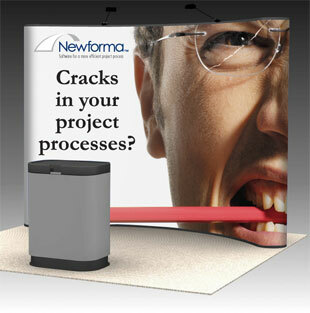 Why choose Scribble Creative Group to design your trade show booth? Because we're going to start with a solid creative marketing strategy foundation and build your trade show exhibit from there. We're a marketing group, we're not a trade show exhibit vendor. We're NOT only interested in selling you a trade show booth, we ARE much more interested in providing you a marketing solution that will have a return on your investment. Whether you need a new trade show booth, pop-up or other exhibit, Scribble offers complete creative services including concept development, design, copywriting and printing — all managed in-house and on budget. (See our online gallery.) We even provide hassle-free delivery to your event. Like everything else we do, Scribble approaches trade shows as part of an integrated marketing strategy. Your goals come first. So whether you want to introduce new products, reinforce a brand or promote a special offering, we make sure that your message is heard loud and clear.